Cerebral palsy (CP) is a group of neurological disorders usually caused by brain abnormalities early in a child’s development or during delivery. The disorders affect muscle coordination, body movement, and brain functioning. Most children born with cerebral palsy may not display symptoms until months or years later. The cerebral palsy attorneys at Rosenfeld Injury Lawyers LLC appreciate the impact a special-needs child can have on the entire family and work hard to ensure that the legal rights of the child are protected to the fullest extent under Illinois medical malpractice laws. We invite you to speak with an experienced Chicago cerebral palsy lawyer who has worked on cerebral palsy lawsuits, without any cost or obligation. If you are ready to get answers to determine if a physician’s negligence caused your child’s CP, we are here for you and offer years of experience in working with cerebral palsy lawsuits. It is possible to have mixed-type cerebral palsy, a combination of the different types of cerebral palsy listed above. For additional information, please view our practice pages for Ataxic Cerebral Palsy, Spastic Cerebral Palsy and Hemiplegic Cerebral Palsy. What are Some Indications That my Child has CP? Signs that your child has a developmental or neurological disorder may not be immediately apparent because they are unable to communicate symptoms. If you observe abnormalities in motor function development, contact your pediatrician. One of the reasons doctors must perform tests over an extended period of time is cerebral palsy is often accompanied by other conditions that are either related or exist independently. Understanding cerebral palsy begins with an understanding of the primary conditions. These conditions exist solely because of an injury to the brain or a birth defect and do not follow a progression as found in similar neurological conditions. Motor control and coordination— the areas of the brain affected by the injury or deformation make it difficult for the brain to communicate with other areas of the body. The result is impaired motor function and difficulty walking or moving. Poor muscle tone— muscle tone is affected by atrophy of muscles impacted by the inability of the brain to communicate properly with the affected limbs. Over time, this exacerbates difficulties with motor function because the muscles become too weak to perform their intended functions. Posture and balance— children when cerebral palsy often face difficulties maintaining proper posture and balance because the muscles normally used to support balance are affected and weakened over time. Oral motor function— despite any knowledge or understanding of language, children with cerebral palsy may find it difficult to form words because the brain may be unable to communicate with the muscles responsible for speech. These muscles perform other vital functions and diminished oral motor function can result in secondary conditions. Secondary conditions occur due to complications arising from primary conditions. These conditions may or may not be progressive and in some cases, therapy and treatment may reduce the severity of secondary conditions or their chance of occurrence. Difficulty chewing, swallowing and breathing— the loss of oral motor function can impact the ability of a child to control drooling and to chew and swallow properly. This makes routine tasks such as eating hazardous as they become choking hazards and excessive drooling can lead to skin irritation or pneumonia. Impaired vision or hearing— the muscles responsible for controlling the movement of the eyes may be affected and this can result in lazy or crossed eyes. Over time, this can lead to double vision or force the brain to ignore signals from one of the eyes entirely. Children with cerebral palsy are also more prone to experiencing hearing loss over time, requiring frequent monitoring of any progressive loss of hearing and vision over time. Incontinence— it may be more difficult for those diagnosed with cerebral palsy to maintain bowel control and the condition may worsen over time as the muscles continue to become weakened. Failure to thrive— this is a medical term for the delayed development or growth in children suffering from cerebral palsy and is directly related to the child’s loss of motor function. Over time, the muscles and joints affected by the condition do not grow and develop at a normal rate and can contribute to deformities and make it more difficult to overcome diminished motor function. These conditions are not caused by cerebral palsy but a link has been established between cerebral palsy and these associative conditions. An associative condition may exist regardless of whether the child has been diagnosed with cerebral palsy and is indicative of brain damage that has occurred in another area of the brain. Epilepsy— many children affected by cerebral palsy suffer from seizures and uncontrollable muscle spasms. Studies have linked some form of epilepsy to around half of those diagnosed with cerebral palsy. Learning disabilities— mental retardation and intellectual disorders are strongly linked to cerebral palsy. Many also suffer from behavioral disorders and some form of learning disability such as ADHD, autism and retardation and while the conditions themselves have not been directly linked to cerebral palsy; a link has been established between the condition and diminished mental capacity. Yes, many cases of cerebral palsy are linked to injuries sustained during pregnancy or the delivery of a child. Cerebral palsy is primarily the result of delayed action or the failure to detect injuries that can impair brain development or function. In most cases, children with cerebral palsy are affected by the condition for life and require ongoing care for the treatment of their symptoms. There are links between elevated bilirubin levels and cerebral palsy due both to the ability of bilirubin to freely pass into the brain and the undeveloped liver’s inability to process and eliminate bilirubin from a newborn’s system quickly. Depleted oxygen levels also play a factor in the development of cerebral palsy as the areas of the brain affected are responsible for the development of common motor functions, balance and the ability to speak. Injuries that can eventually result in the development of cerebral palsy if not properly addressed include the following. Infections. during pregnancy or as the result of injuries sustained during birth. Infections threaten brain development by triggering an immune response, elevating internal temperature and increasing bilirubin levels. Most infections are cured through the administration of antibiotics if properly detected. Detachment of the placenta during birth. This can cause uncontrolled bleeding, limiting the supply of blood reaching the brain. The mother and child need to be monitored for signs of distress during labor and delivery. Injuries to the head that are the result of assisted delivery devices such as forceps or a vacuum. One prevalent symptom of injuries sustained in this manner is the presence of a caput succedaneum, which is a formation on the scalp that results from bleeding and swelling following the use of delivery devices to suction the child’s head. Bleeding results in the production of bilirubin, babies who have sustained trauma need to be monitored for jaundice as this is a sign of elevated bilirubin levels. Genetic mutations or predispositions. In some cases, genetic markers or mutations that occur naturally throughout pregnancy may increase the risk of cerebral palsy or act as the catalyst. Hypoxic-Ischemic Encephalopathy (HIE): HIE is a brain injury that is the result of asphyxia to the brain. This lack of oxygen can happen during pregnancy, childbirth, or events after birth. Injuries sustained following birth. Some cases of cerebral palsy the result of a traumatic injury occurring during the developmental stages. Blows to the head such as from a fall or sustained in a car accident may result in elevated bilirubin levels. Internal bleeding can limit the supply of oxygen to the brain, resulting in the death of cells important to cognitive and motor function. Infections which occur after birth. Infants possess underdeveloped immune systems and are susceptible to infection in the months following delivery. It is important to detect the presence of serious infections such as meningitis as they are linked to the development of cerebral palsy in infants. Cerebral Dysgenesis: This is abnormal brain development and is not from the result of an injury to the brain. Periventricular Leukomalacia (PVL): This is damage to the white matter of the brain. The majority of infants diagnosed with PVL will also have cerebral palsy. Intraventricular Hemorrhage (IVH): IVH is hemorrhaging or bleeding in the brain. Bleeding can cause a hematoma that can damage brain tissue. While medical error is not always the primary cause of cerebral palsy, it is important to note that around ten percent of cases have been linked to medical negligence. Doctors and medical staff should take the following precautions in order to ensure the safety of the unborn child throughout the pregnancy, labor and delivery. Proper monitoring of the child throughout the pregnancy in order to detect abnormalities, mutations, infections or other risk factors that place the child at risk of developing neurological disorders. Special treatment must be given to children who are born prematurely or who have a low birth weight as these factors increase the chance of hemorrhaging during and after delivery. A definitive link has been proven between premature birth and cerebral palsy, some studies have suggested that premature babies could be up to 80 times as likely to develop cerebral palsy as those delivered at full term. The heart rates of both mother and child need to be monitored during delivery in order to detect symptoms of fetal distress. If the baby exhibits an abnormal heart rate, it is likely a symptom of reduced blood or oxygen supply and represents a threat to its wellbeing. 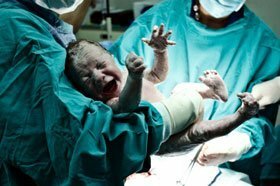 Doctors must make decisive decisions regarding the use of an emergency cesarean section if it is determined the child or mother is in distress. Monitoring newborns for the presence of jaundice. The yellow coloration that accompanies bruising is due to bilirubin excreted during the healing process. The liver is normally able to regulate bilirubin levels and eliminate any excess bilirubin through urine, but newborns’ livers are unable to eliminate the substance quickly enough. This results in the yellowing of the skin and eyes as bilirubin accumulates throughout the body. If detected in time, the condition is easily treatable. Failure to act in time allows excess bilirubin to reach the brain and cause harm to areas responsible for motor function and speech. How Long do I Have to File a Cerebral Palsy Lawsuit in Illinois? Generally, Illinois medical malpractice lawsuits must be commenced within two years from the date of the incident alleged, however for cerebral palsy there are many factors that may extend this time allowance. (See 735 ILCS 5/13-212.) However, if the person is deemed ‘disabled’ the statute of limitations may be extended to allow them to pursue a case beyond the ‘normal’ time constraints. Every case is different and each child's past, current and future needs are unique. Our attorneys fight for all available benefits when presenting evidence in court or negotiating with an insurance company. Due to the fact that many people with CP experience life-long disabilities, many cerebral palsy cases have considerable value. Below are some examples. The mother was admitted to a hospital in the early hours and the doctor did not see her for nearly four hours. Over the next two hours, he helped deliver the child. The umbilical cord was wrapped around the baby’s neck. The breathing problems could have been noticed if the staff checked the child’s heart rate. Plaintiffs’ counsel showed that red flags for this issue were ignored. Several times the nurses and doctor put aside reports that the child couldn’t breathe and had a rapid heart rate. The oxygen failure produced many harms including cerebral palsy. The child was born disabled. She would need medical care for the rest of her life. She would never be able to speak, walk, or work. Through her parents, she sued the hospital, obstetrician and nurses. The suit stated that their combined negligence caused the family’s damages. They sought money for past and future medical bills, disability, pain, and other losses. Insurance companies for the defendants worked out a settlement. The mother entered a Georgia hospital for delivery. She claimed nurses didn’t properly monitor the birth. The child experienced oxygen deprivation leading to cerebral palsy, epilepsy and traumatic brain injury. The plaintiffs used expert testimony to exhibit what the nurses should have done and show the defendants’ breach led to injury. A mother in the 38th week of pregnancy with twins arrived at a Massachusetts hospital. Initially, the doctor tried to use a vacuum to deliver. Then, the doctor chose to perform a C-section. This took one hour and one of the kids had to be resuscitated. Years later, he was still seriously affected by the birth. He had cerebral palsy and other physical and sensory impairments. He couldn’t walk or talk as he should be able to for his age. The parents sued the hospital and doctors claiming the defendants acted contrary to medical norms and should have performed a C-section initially. Before trial started, settlement for the plaintiffs was agreed. This dispute centered on the exact manner in which the baby was delivered. The plaintiffs said that the child was turned improperly by the doctor and that force restricted the air flow leading to complications. The child suffered cerebral palsy. She would forever have difficulty with speech and walking. Her parents would need to secure medical care indefinitely. They sued the doctors and the treatment center. Their claims focused on the method of delivery and how this veered away from customary techniques. Then, they illustrated the effect it had on the child. The mother received Pitocin during labor. The baby had signs that should have stopped this as her heart rate slowed, and she had hyperstimulation. Nevertheless, they persisted in the medication. The doctors tried to deliver with a vacuum. When that didn’t work, they did a C-section. The child was in a critical condition at this point. She had acidosis and had to be resuscitated. She had major injuries including cerebral palsy, impairing her brain and motor functions for the rest of her life. Plaintiffs asserted their past damages including medical bills as well as the pain and disability the child would suffer and reached settlement. At 38 weeks into pregnancy doctors induced because of hypertension. They gave 100mg Cytotec vaginally, four times the suggested dose. This caused problems including bradycardia (slowed heart rate). When the child was born, he had acidosis. This produced cerebral palsy. Lawyers for the family pointed to the dosage error that was responsible. He needed a device to speak and required medical care for the rest of his life. They predicted millions in long-term medical needs, lost wages, pain and other damages. The family received $9 million after valuing past and future economic and non-economic losses. This included reduced normalcy, suffering and medical care. The mother delivered at 42-weeks pregnant. The doctors performed a C-section and waited despite the child’s large size (9 pounds), thick meconium, and other factors exhibiting an overdue pregnancy. The child later claimed negligence causing a seizure disorder, cerebral palsy and other problems. By age 16, her brain had only developed to the level of someone 8 years old. The value she wanted totaled the care required, reduced life enjoyment, lost wages and pain. A doctor was given an echocardiogram of a one-month old. As a result of misdiagnosis, the baby went hours without care. This created a hypoxic brain injury leading to cerebral palsy and other problems. In court, the family showed almost $1 million in medical bills for the first doctor’s failures. Emphasis was put on the child’s future pain, costs, and disability when valuing the claim. The family recovered $1 million from the doctor. They secured $800,000 from the hospital. Also, they brought other claims against related medical professionals. They argued the defendants failed to see and cure the baby’s health problems. That failure led to cerebral palsy and a lifetime of pain and expenses. The victim experienced hypoxic-ischemic trauma during birth giving her cerebral palsy and a seizure disorder. She died years later as a direct result of these complications. The mother sued the hospital and professionals that performed the delivery. She contended they negligently didn’t recognize heart defects. The woman was allowed to collect on the pain the child experienced before passing. In addition, it applied to losses including medical bills, lost normal life and lost companionship. This mother was a smoker, diabetic and had an inadequate placenta. Prior to birth, the child developed chronic hypoxia resulting in cerebral palsy. The mother sued the hospital and treating doctor suggesting they should have done a C-section. The defendants contended the mother’s prior health problems caused the condition but, couldn’t explain why they didn’t explore other options. Their inability to detect heart issues was egregious. Both the doctor and the hospital settled with the plaintiffs. The doctors decided to deliver twins naturally. They considered a C-section but ruled it out. The first baby was delivered without problems. The doctors attempted a vacuum maneuver then reverted and did a C-section. The child developed hypoxic brain damage leading to cerebral palsy and permanent disability. The family sued the hospital and doctors seeking damages for the immediate and long-term effects of this trauma. The family received a little more than $5 million. A point that raised the settlement value was the family could show a C-section would have stopped cerebral palsy. This case involved twins born at 27 weeks. One twin showed signs of an infection and was effectively treated. The other child wasn’t checked for infections despite being at high risk. Meningitis set in as well as cerebral palsy. The medical bills alone were almost $500,000. That didn’t include the long-term care she’d need to live. The parents sued the hospital and doctors. They alleged the defendants breached fundamental duties by not checking her for infections, despite doing this for the other twin. The family recovered damages representing losses the kid and family suffered. Our Chicago cerebral palsy lawyers understand the frustration and anger parents may feel, knowing that their child’s cerebral palsy is due to a physician’s error. You can be assured that Rosenfeld Injury Lawyers LLC have the experience, resources, and commitment to pursue all responsible parties. We will work hard to see that the cerebral palsy lawsuit is successful and that your child receives full compensation for all damages as set forth by the applicable laws. Begin the process now and contact us for a fee consultation. When Hospitals Monitor Women in Labor, C-Sections Can Be Reduced A new study indicates that mothers and babies can be protected from serious delivery complications involving C-sections that sometimes end in death.